Hurricane Harvey hit Texas with a blast in early September. Not to be outdone, Irma slammed the coast of Florida sixteen days later and moved inland with devastating speed. Close on her heels, Jose hit the Leeward Isles and Maria ravaged Puerto Rico, both eyeing the eastern seaboard with hungry intensity. While the insurance industry has been eyeing climate change for years and preparing for the impact of an increasing number of severe weather events,[ii] one must wonder whether carriers are doing enough to protect consumers and deliver the coverage they need. In the wake of two major, back-to-back hurricanes, insurers need to consider the impact of customer retention on their bottom line. The claims process is a time of testing for customer-insurer relationships, and pre-storm satisfaction rates could float insurers through difficult negotiations. Bain predicts that a 5% increase in customer satisfaction raises profits 95%. As losses from meteorological events from the last ten years reach an all-time high, the insurance industry is about to see just how customer-centric it is. It was Paul Carroll, CEO and editor-in-chief of Insurance Thought Leadership, who first raised the question: ? In the aftermath of Hurricane Harvey, would insurers fail to rally resources, such as adjusters, or increase customer satisfaction and loyalty by sustaining them through the harrowing post event cleanup and rebuilding? How insurers approach catastrophic events says a lot about their commitment to their customers, but generating loyalty starts well before the storm. A similar situation is about to unfold in Texas where two-thirds of businesses do not have business interruption coverage. [viii] Customers are often unaware of the types of policies available to them or what they should be covered against. They rely on carriers, brokers and agents to advise them, but many insurers lack the products their customers need to be prepared for storm events. Varying state regulations discourage many insurers from offering storm-related coverage to some, or all of their customers. Residential homeowners and businesses with property values under $500,000 can receive flood insurance from the National Flood Insurance Program (NFIP), but these policies do not cover damage from hurricane force winds. This is where homeowners coverage kicks in for most states, while others require a separate policy. For 18 coastal states, homeowners deductibles for wind damage are set by insurers on a state-by-state basis at a percentage of the home’s insured value, instead of a flat dollar amount. Looking at insurance across state lines, it becomes easy to see why it takes an insurer from 6 months to a year to develop a new product and why many insurers don’t offer homeowners coverage or restrict coverage to certain markets. Reviewing state-by-state variances, however, doesn’t educate insurers on the advantages of offering the full range of policies their customers need. Bain’s bi-annual customer behavior and loyalty survey produces compelling evidence for insurers to offer customers multiple types of coverage. Customers who buy more, stay longer. Services like these go right to the insurer’s bottom line, driving down claims and improving customer satisfaction. Adding more insurance products does the same. In an effort to raise customer satisfaction and retention rates, a leading insurer responded to customer demands for homeowners coverage by adding products from other insurers to their auto offerings. They were able to present 70% of customers with an offer and saw 35% conversion rates that doubled policies sold in a year. Improving digital capabilities contributed significantly to the insurer’s success. A streamlined interface gave agents the ability to quote, bind and issue in-house products and policies from other carriers swiftly and efficiently. Bain’s customer behavior and loyalty study confirms that offering the coverage consumers need is an important part of generating the satisfaction that leads to retention. Results from leading insurers also underscore the benefits. Only time will tell if more insurers take the cue to create long-term customer-insurer relationships. [i] “List of New England Hurricanes.” Wikipedia, Sept. 13, 2017. Web. [ii] Nevius, John G. and Robert M. Horkovich. 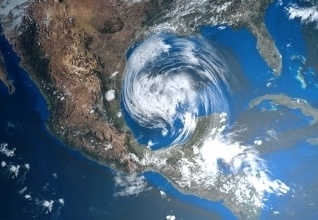 “Climate Change and its Impact on the Insurance Industry.” Risk Management. The Risk Management Society, Feb. 3, 2015, Web. [iii] “Insurance Nexus Customer Engagement Survey.” InsuranceNexus, 2017. Web. [iv] “ACSI Finance & Insurance Report 2016.” American Customer Satisfaction Index, 2016. Web. [v] Progressive. “2017 Second Quarter Report.” www.progressive.com. (2017: 53). Web. [vi] Progressive. “2017 Second Quarter Report.” www.progressive.com. (2017: 53). Web. [vii] Blair, Russel. “Hartford insurers Brace for More Claims from Irma.” Hartford Courant, Sept. 7, 2017. Web. [viii] Graham, John. “What it Takes to Inspire Insurance Client Confidence.” Property Casualty 360. ALM Media LLC, Sept. 21, 2017. Web. [ix] “Background on: Hurricane and Windstorm Deductibles.” Insurance Information Institute, Sept. 1, 2017. Web. [x] “Background on: Hurricane and Windstorm Deductibles.” Insurance Information Institute, Sept. 1, 2017. Web. [xi] “Customer Behavior and Loyalty in Insurance: Global Edition 2016.” Bain, 2016. Web.